Found 3 file extension associations related to iMPACT and 3 file formats developed specifically for use with iMPACT. iMPACT, a tool featuring batch and GUI operations, allows you to perform the following functions: Device Configuration and File Generation. The Device Configuration enables you to directly configure Xilinx FPGAs or program Xilinx CPLDs and PROMs with the Xilinx cables (MutiPRO Desktop Tool, Parallel Cable IV, or Platform Cable USB) in various modes. 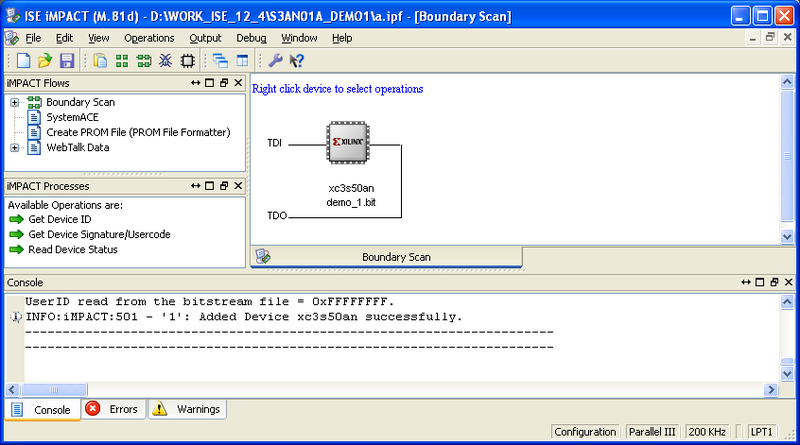 In the Boundary-Scan mode, Xilinx FPGAs, CPLDs, and PROMs can be configured or programmed. In the Slave Serial or SelectMAP configuration modes only FPGAs can be configured directly. In the Desktop Configuration mode Xilinx CPLDs or PROMs can be programmed. In the Direct SPI Configuration mode select SPI serial flash (STMicro: M25P, M25PE, M45PE or Atmel: AT45DB) can be programmed. If you need more information please contact the developers of iMPACT (Xilinx, Inc.), or check out their product website.